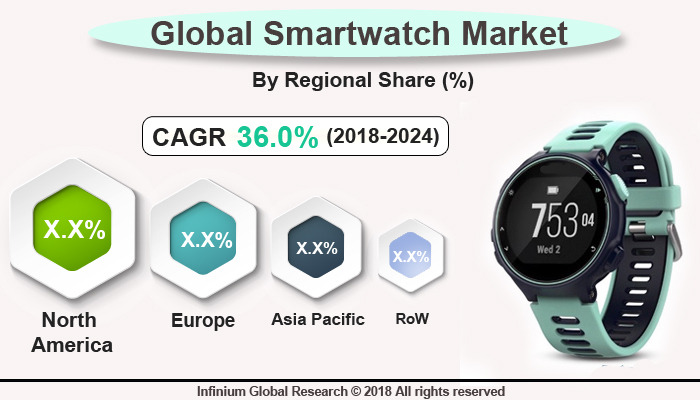 A recent report published by Infinium Global Research on Smartwatch Market provides in-depth analysis of segments and sub-segments in global as well as regional Smartwatch Market. The study also highlights the impact of drivers, restraints and macro indicators on the global and regional Smartwatch Market over the short term as well as long term. The report is a comprehensive presentation of trends, forecast and dollar values of global Smartwatch Market. According to report the global Smartwatch Market is projected to grow at a CAGR of 36% over the forecast period of 2018-2024. A Smartwatch is a touchscreen wearable computer in the form of a wristwatch. Early Smartwatch models used to perform basic tasks such as displaying digital time, calculations, However, after 2010 Smartwatch manufacturers have been successful in adding similar functionality to that of smartphones and also provided several features of the smartphone such as Bluetooth connectivity, translations, browsing, and game-playing facilities etc. Some Smartwatch function as portable media players, with FM radio and playback of digital audio and video files via a Bluetooth or USB headset. Some models, called 'watch phones' have complete functionality of a typical smartphone using LTE technology. The ability of Smartwatch to seamlessly integrate with day-to-day official works, and health-related activities into an application-based module is making this product more demanding. Additionally, Smartwatch is capable of making and receiving phone calls directly via blue-tooth connected mobile phones and displaying real-time messages, and incoming phone call alerts, all of which allow users to more conveniently stay connected with their friends, family and business associates. These types of Smartwatch are increasingly becoming popular among younger consumers, who like to in touch of their office and family simultaneously. Additionally, it helps to track and maintain consumer’s personal health and fitness schedules and send them alert about any change in health situation. According to a recent study, Smartwatch and healthcare fitness wearables have backed the widespread awareness on tracking personal health among people and pushed their outlook toward a healthy future. Thus, the growing awareness of personal health in people is a growth driver for the Smartwatch. The rapid emergence of technology has made people more conscious about their health and fitness, and applicability of smartphone to do several complex works. With better access to technology, people are increasingly using advanced gadgets to maintain their fitness levels. In this context, Smartwatch helps them in tracking their daily activities and reducing bad practices that may affect their wellness in the long run. North America serves as a great market for revenue generation, followed by European countries, due to the presence of a large number of manufacturing companies in this region. Asia Pacific region is showing the highest CAGR growth rate in the Smartwatch globally, due to growing disposable income among middle-class consumers, and exposure to several media about the benefits of using Smartwatch etc. The report on global smartwatch market covers segments such as products, application, and operating system. On the basis of products, the global smartwatch Market is categorized into extension smartwatch market, standalone smartwatch market and classical smartwatch Market. On the basis of application, the global smartwatch market is categorized into personal assistance, wellness, medical/health, sports, and others. On the basis of the operating system, the global smartwatch market is categorized into android, IOS, windows and others. The report provides profiles of the companies in the global smartwatch market such as, Apple inc, Google inc., Garmin, Fitbit, Motorola, Sony corp, Samsung electronics co. Ltd., Lenovo Group, Pebble Technology, ASUSTeK Computer and Fossil Group. The report provides deep insights into demand forecasts, market trends, and micro and macro indicators. In addition, this report provides insights into the factors that are driving and restraining the global Smartwatch Market. Moreover, IGR-Growth Matrix analysis given in the report brings an insight into the investment areas that existing or new market players can consider. The report provides insights into the market using analytical tools such as Porter's five forces analysis and DRO analysis of the smartwatch market. Moreover, the study highlights current market trends and provides forecast from 2018-2024. We also have highlighted future trends in the Smartwatch Market that will impact the demand during the forecast period. Moreover, the competitive analysis given in each regional market brings an insight into the market share of the leading players. This report will help manufacturers, suppliers, and distributors of the smartwatch market to understand the present and future trends in this market and formulate their strategies accordingly.